HDD or SDD, What’s the difference? The hard drive is one of the components IT professionals look at when they’re buying a new computer, often worrying about things like read speed and storage space. Until a couple of years ago, there was only one type of internal hard drive available to computers, Hard Disk Drives (HDD). Now, manufacturers are starting to use a second kind, Solid-state Drives (SSD) and many customers are wondering which is better. Here is a brief comparison of Hard Disk Drives and Solid-state Drives. Hard Disk Drives are the most common type of storage drive in modern computers, and have been since they were first introduced in the 1960’s. 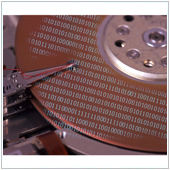 HDDs are comprised of a series of disks that are coated in a magnetic material. Sitting just above these disks are a series of magnetic devices that can both read and write content on the disks using magnetism generated by electrical impulses. HDDs are relatively cheap to purchase, with an average price of $0.07 USD per Gigabyte of storage space, and can rewrite data a near infinite amount of times. There are two major weaknesses of HDDs, the first being that they are made of moving parts, and any bump or shock can ruin the drive. The second weakness is their read and write speed, which hasn’t really increased in the past few years, compared to processors or other components. Solid-state Drives are a newer form of hard drive, around in one form or another since the 1970’s but not gaining popularity until the mid 1990’s. As the name implies, SSDs have no moving parts, data is stored in integrated circuits and can be accessed quickly. Chances are high that you use USB storage drives in your company. USB storage drives are a close cousin to SSDs, using the same form of storage – integrated circuits. The biggest advantage to SSDs is that they’re extremely fast when compared with HDDs, feature moving parts, use less power to operate and are more resistant to shocks and damage. There are two major disadvantages to SSDs, the first being cost, on average, $1.50 USD a Gigabyte, an expensive investment for many SMEs. The second disadvantage is you can only write the data a limited number of times before the device becomes unusable, most SSDs last around 5 years. While SSDs may seem expensive upfront, they do help computers run faster, which means you can buy a processor with a lower speed and have an SSD compensate. While they may only last 5 years, most computers don’t last that long, so normal users should be ok.
There’s a hot debate going on on the Internet, should users go with SSDs or HDDs? The best suggestion is to go with both. Use SSDs to store essential programs like the OS, and HDDs to store data. That way you can experience fast booting and loading of essential programs, while not having to invest in a high capacity SSD. While SSDs will most likely replace HDDs in the future as their cost per gigabyte is rapidly dropping, making them even more popular. At this time however, both drives will remain in production and you will probably see more and more computer manufacturers using both drives. What type of hard drive do you use? Do you think SSDs will help your business? Comment below, or contact us for more information. PreviousPrevious post:5 tips to be prepared for disasterNextNext post:1.5 million accounts hacked, was yours?